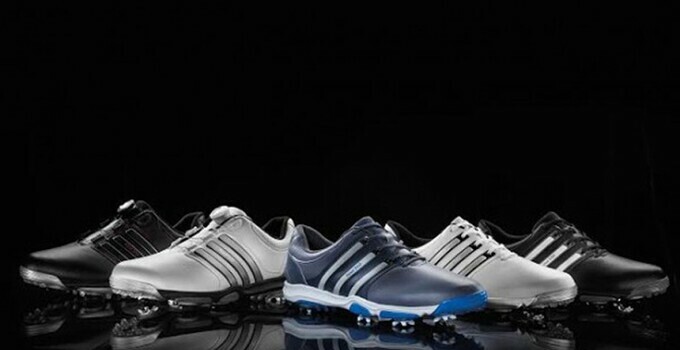 adidas Golf is stepping up its shoe game. Last week, the company introduced its new tour360 x line of golf shoes, the latest iteration for the long-running collection. Ask any golfer what they want in a golf shoe, and the two answers are obvious: comfort and traction. The tour360 x line furthers designs that have proven to provide golfers just that combination. The upper of the shoe prevents water from getting in the top, combining microfiber leather with the company's ubiquitous Climaproof technology. Its outsole has been redesigned as well. The nine cleats on the outsole are arranged in an X pattern, with the cleats keeping contact with the ground as much as possible through the swing. The cleats themselves are lower to the ground, too, with the aim of reducing green damage. The outsole is not only lighter in the tour360 x, but also made more comfortable with EVA foam -- popular in many golf shoes these days -- throughout the bottom of the shoe. And while that all seems great, the eye-grabbing optional feature of these shoes is that they basically tie themselves. The tour360 x Boa model features a Boa Technology dial on the center of the tongue, enabling the player to literally dial in the fit exactly how they like it. It's a different take on what you may have seen in FootJoy's DNA shoes. The tour360 x will retail for $140 and hit stores in three styles on Nov. 1, with another three to come a month later, the same day as the Boa model (MSRP: $180) will hit the market in two styles.